Treat your family, friends, or co-workers to a Team Blue Gift Card. Gift Cards are the perfect way to help celebrate birthdays, holidays, anniversaries or other special occasions. You can purchase a Gift Card for car wash and detail services, in any amount that suits your needs. You can use Team Blue Gift Cards only at place of purchase. 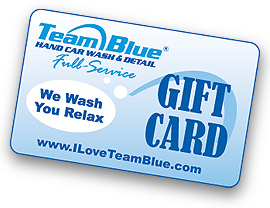 Team Blue Gift Cards are redeemable for car wash services, beverages and merchandise. Just ask a Team Blue Staff Member for help in purchasing your Gift Card today!